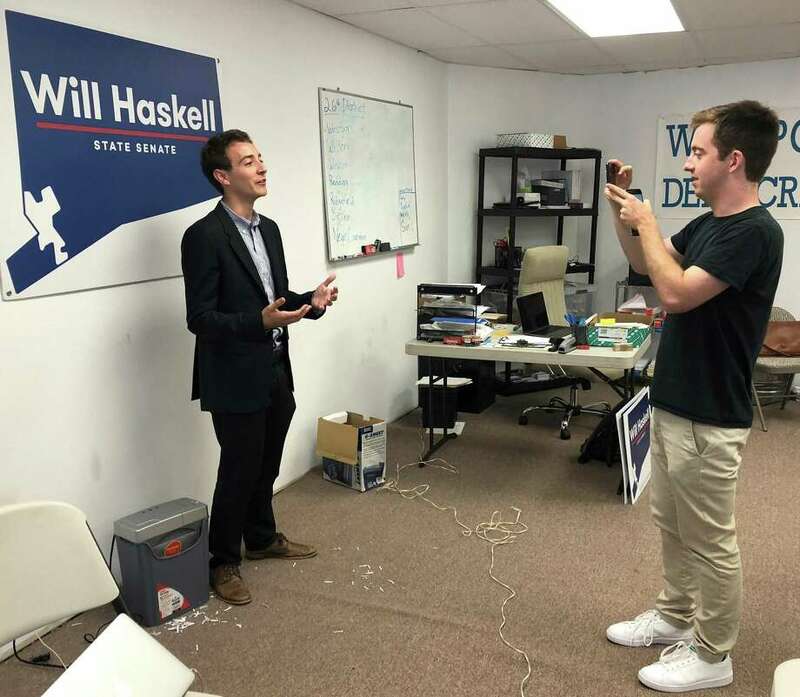 Will Haskell, the Democratic candidate for the 26th state senate district, films a video in the Democratic campaign office in Westport with his campaign manager, Jack Lynch, on July 31. WESTPORT — Will Haskell’s work day ended the same way it began: surrounded by teens and early 20-somethings at the Democratic campaign headquarters in Westport. “If the race was decided by high school seniors, I think Will would win in a landslide,” said Jack Lynch, Haskell’s campaign manager for the 26th State Senate district, which includes parts of Bethel, New Canaan, Redding, Ridgefield, Weston, Westport and Wilton, as we waited in line for dinner at Westfair Fish and Chips on the last Tuesday evening in July. Lynch, who grew up in Westfield, N.J., is Haskell’s best friend and was his roommate for all four years at Georgetown University. The day after the two men graduated from Georgetown in May, they packed up Lynch’s car and drove to New Canaan, where they live in an apartment downtown, although Haskell grew up in Westport. Haskell neglected dinner because he was busy calling district residents at the campaign’s weekly Tuesday night phone-banking event. The campaign has taken up so much of his time that he misses more than just Tuesday dinner. “I’ve been forgetting to eat. It’s terrible. I’ve actually lost a lot of weight doing this. I eat lunch or dinner, but usually not both,” Haskell said. When I joined Haskell at the Democratic campaign headquarters in Westport around 1 p.m., he was about to eat his one full meal of the day, some pizza, which he ate along with the campaign’s four interns then in the office. The campaign has had between 25 and 30 interns over the course of the summer, but only about 10 to 15 come in every week, Lynch said. Each of the interns seemed called to work, unpaid, for Haskell’s campaign, by some direct interaction with the candidate. Westport resident and incoming Staples High School senior Layla Wofsy said she interviewed Haskell for the school paper, Inklings News, and afterwards wanted to get involved with his campaign. “The fact that he’s young and going against a Republican that’s been in office so many years and no Democrat has been in that office for years” are the reasons Wofsy said she supports Haskell over incumbent Republican Toni Boucher, who has represented the 26th District since 2008. It matters to Haskell’s interns that he’s young, a Democrat, and makes them feel their voice has power, and somehow all of these traits are wrapped up in what nearly every young Haskell supporter said they care most about: ensuring strong gun regulation. As the interns called district residents and conducted policy research for Haskell’s weekly “How I’d Vote” email that compares Boucher’s voting record with how Haskell says he’d vote, Lynch films a video of Haskell to send to Run for Something, a progressive organization that recently endorsed Haskell. “The eloquence of the Parkland students paved the way for many young people to get involved,” Haskell says in an animated voice that he turns on for the video. Indeed, the message of Parkland is so integral to Haskell’s campaign that it’s one of the primary pitches he makes to residents as he knocks on doors with campaign volunteers starting at 2:45 p.m.
“I think we need to do more to stop gun violence, and we have someone who’s rolling back gun legislation,” Haskell said to a resident when she opens the door for Haskell. Boucher’s sponsorship of a bill in 2017 that would have allowed gun clubs and shooting ranges to sell ammunition is one way Haskell said Boucher’s policies on guns endangers state residents, though Boucher defends the bill, saying it was asked for by constituents. Aside from gun control, the issue that comes up most frequently in Haskell’s door-knocking stump speech is President Donald Trump. “We’re represented by a person who’s embraced Donald Trump,” Haskell tells one resident, adding Hartford is Connecticut’s first line of defense against Trump’s policies, including on gun regulation. For her part, Boucher said she’s put out several strongly worded statements against Trump’s actions, most recently about his summit with Russian President Vladimir Putin. After the volunteers who knocked on doors with Haskell leave around 4:30, he continues for another hour to reach his self-imposed quota of 40 doors per day. “I can’t go to sleep unless I’ve done 40,” Haskell said. Upon return to headquarters at 5:45, the phone-banking, which began at 5:30 and ended at 8:30 p.m., is in full swing under the guidance of Lynch. Over 20 phone-bankers attended, most of them young people from towns across the district and older women from Westport who voiced the same concerns as the interns — frustration with Boucher’s voting record, a desire for a Democrat in the 26th district, and excitement over a new generation of leadership. Haskell’s supporters feel a collective responsibility for his campaign, and likewise, Haskell believes he can only win with the strength of his supporters.